Saturday, December 18, 07. New England was completely snow-covered so it was a perfect day for an indoor iceboat tuneup clinic at Steve Lamb's shop in Canton Mass. Planks were clamped to the I-beam strongback and chocks were aligned, runners were profiled and honed. Iceboating tech was discussed and displayed, bought and sold -- and lunch was served. Thanks to Steve and Linda Lamb for hosting this event! I think this was their fourth annual tuneup. There were some more new members, and I was glad to find out that there is a group of DN sailors in the Kingston, NY area connected with the Kingston Sailing Club who sail with the Hudson River Ice Yacht Club on the Hudson. That's pretty close to me in Albany, so I'll be in touch. I was impressed by Steve's machine for profiling Sarns plates. It was made from a big DeWalt radial arm saw, modified by Leo Healy with a self-dressing stone and the profile built right in to the travel of the machine. Later Jeff Brown demonstrated his hand honing technique, and there was a lot of discussion about which stones to use and where to get them. The trick is to use stones so small that your fingertips aren't tempted to roll up over the edge of the runner. A larger stone is out of contol. The most crucial thing for the effortless glide is for those runner edges to be perfect. Steve Duhamel remarked, 'It's amazing the number of things that have to be correctly done to make an iceboat perform to its potential.' That's the purpose of the clinic, there are a lot of things to look after if you want your boat to work right. This year we did runner profiling and sharpening, chock alignment, orientation of the plank to the boat -- the details of where the boat meets the ice. 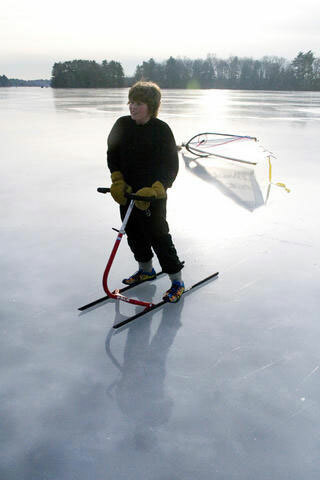 It's the effortless glide that gets us hooked on iceboating, maybe in a borrowed iceboat, or riding along with someone. After a while we find out that it's not really all that effortless. Eventually we learn about light boxes and machinist straightedges, shims and rocker, honing stones, dial indicators and specialized machines designed to remove small amounts of metal in ways only iceboaters understand. So there we all were, 20 or 25 of us talking and learning, helping each other get things right, tweaking our gear, spending money, all in service to the effortless glide. After spending 2 hours digging my trailer out of a foot of ice and snow, I headed down to Norton Reservoir Saturday morning. Although the reports were good, I was still sceptical about how good the ice really was. As I headed south, there was less and less snow, until I was almost to Norton and there was virtually no snow on the ground. I arrived at 9:00am and looked out on this large expanse of perfectly smooth ice. No one was at the launch site I had picked, but as I looked down the lake, I saw a few boats setting up. No wind yet, but with this smooth ice, we wouldn't need much. Had my first cup of coffee, set up my DN and walked down the lake to where a few boats were set up. Now there was just a hint of a breeze, but still not enough to sail. Headed back to my boat and poured another cup of coffee and sat down to enjoy the day. A few DN's were out on the ice, trying to find wind. I decided to push my boat out to where some boats were parked and as I arrived, I could feel a slight breeze. I pushed off and I was moving. After a few more pushes, I could keep the boat moving throught the tacks. Within the next half hour, we were all moving well. I could see marks being set out for racing and many more boats were heading out onto the ice. For those of you who were there, you know just how magical the day was. Dn's racing, a variety of boats sailing around, skate sailors, families out skating and fisherman...all enjoying the almost perfect conditions. After this thaw, I hope we see many more days like this one. New member Dale Wolfield gets her chocks aligned by the mirrror method. Steve Lamb checks a runner profile on the lightbox. Looks pretty good! Linda looks after the lunch counter. James Lamb on his kicksled at Norton last Saturday. Look at that ice!